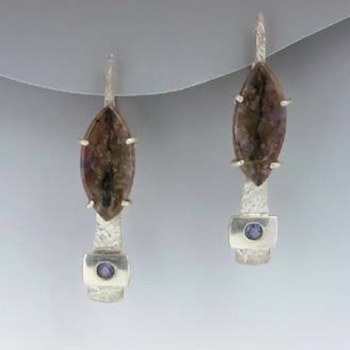 Flush setting faceted stones directly into sheet metal seems impossible. It is, however, a skill you can learn and with some practice you will be adding this intriguing embellishment to your work. See more information below. Deb Jemmott and I spent many months (I won’t tell you how many!) 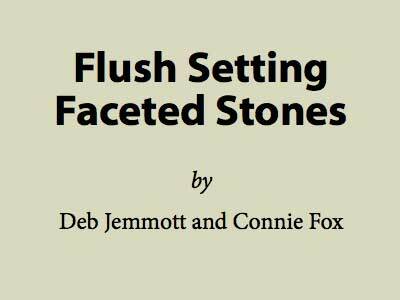 putting together a 20 page tutorial titled “Flush Setting Faceted Stones”. Text, photos, graphics and videos teach you everything you need to know. 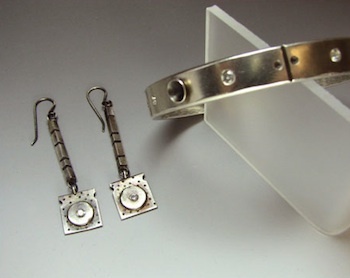 See examples to the right of items made by Deb and myself which have flush set stones. This 48.7MB PDF is too large to email as an attachment – so, within 24 hours of your purchase, you will be emailed your own unique password to download the PDF from our password protected directory. Once you use your unique user name and password to access the file, it may take up anywhere from 30 seconds to 30 minutes to open the PDF in your web browser depending on your internet connection speed. To view all the multimedia features of the PDF on your regular computer, you will need to have Adobe Acrobat Reader. You can download that for free at the Adobe website: Get Adobe Acrobat Reader. The PDF is also easily viewed on an Android tablet with EZPDF Reader that is purchased through the Google Play Store for $1.00. Google Play Store. To view the PDF on an iPad please follow these instructions. Download it on your laptop or desktop computer, then use an online cloud file system (Drop Box, Google Drive, iCloud) to save the tutorial to your free account there. You can then access the PDF from any devise that has an internet connection (including the iPad) by using that devise to access your online account at whichever service you have chosen. The embedded MP4 videos will play on your iPad if you use this simple system.